One of the most important systems found in your home – the fire alarm – can really save your life and the life of your family. One of the most important systems found in your home – the fire alarm – can really save your life and the life of your family. Critical in protecting both building and occupants, fire alarms are devices that can ensure everyone’s safety. In fact, fire alarms can protect families from serious injuries and even death. With that being said, fire alarms have a specific lifespan and will eventually need to be replaced. Here is what you must know about ensuring that your fire alarm works properly throughout the years. During a fire, having a fire alarm that doesn’t work correctly is the worst case scenario. In fact, overall, as fire alarms age, your entire fire protection system decreases in reliability. As a result, it becomes harder to trust that you and your family will be safe in a fire emergency situation. All that stress can easily be mitigated by ensuring that the system maintenance company you hire is approved and accredited. What you should remember is that everyone should change their fire alarms every ten years. 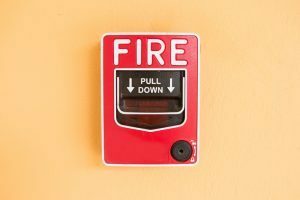 In fact, The U.S. Fire Administration for Homeland Security, the National Fire Protection Association (NFPA), and the Red Cross all agree that after working 87,000 hours (roughly ten years), your fire alarm will start to wear out. Normal environmental conditions within the home can have a significant impact on the actual performance of your fire alarm. As a result, you’ll want to replace it as soon as you reach that ten-year mark. Unsure about when the last time you replaced your fire alarm? Take precautions and replace it anyway. If you still want to know, then check the back of the fire alarm. Ultimately, ensuring your fire alarm works the way it should is essential because it can save you and your loved ones. This entry was posted on Friday, February 16th, 2018 at 9:19 am. Both comments and pings are currently closed.